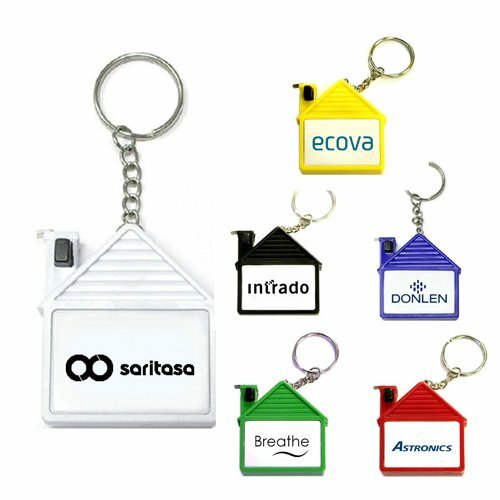 Customized house shape tape measure keychains is a token, which scores on sentimental values and multifunction utility. 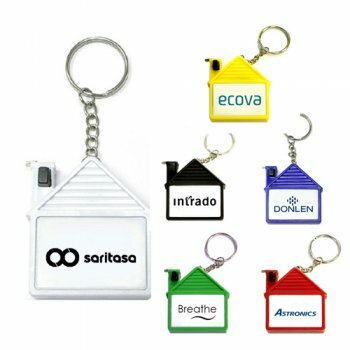 Featuring a 39”inch tape measure and a strong key holder, this keychain works for marketers in real estate and construction related niches. It can be gifted during tradeshows, property expos or even during regular day –to-day operations. Marketers operating in limited budget can avail it for bulk gifting during promotional events. We offer attractive price savings on such wholesome orders and marketers can grab them and expect long term return on their investments. Request a quote to know price savings that can be availed on bulk orders of customized house shape tape measure keychain. Features – House shape tape measure with level and key chain. Solid ABS construction with 39" metal tape measure. Bigger imprint area. Imprint Area: 1 1/4" x 3/4"
Product Size: 1 3/4" x 2"
Product & Design Quality -EXCELLENT COMPANY !!!! VERY HELPFUL!!! Customer Service & Shipping - Fast service.. Great turn around time.. Product & Design Quality -After submitting my design, I received an email with the proof. I had the option to accept or change. It was a very easy process. Customer Service & Shipping - I spoke with a customer service rep who answered all of my questions. This is a great company. The pricing was very reasonable and the product is of good quality. 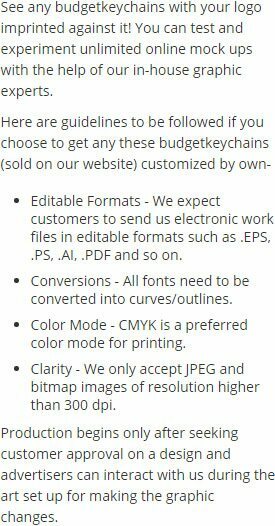 I will recommend Budget Keychains to all of my friends who own a business. Product & Design Quality -They arrived today and look great! Product & Design Quality -Very happy. Just what I wanted. Customer Service & Shipping - Excellent and fast. Product & Design Quality -I am very happy with the product. I plan to order more once I have depleted this stock. Customer Service & Shipping - Perfect. Product & Design Quality -Love them, perfect for our promotional items!